It is said that you can take a Bengali out of Bengal, but you cannot take Bengal out of a Bengali. I’d rather rephrase it by saying that you can never take Durga Puja out of a Bengali. The greatest Bengali festival is once again knocking on our doors and the New Jersey Bengalis are gearing up to greet their Mother Durga with utmost fervor. 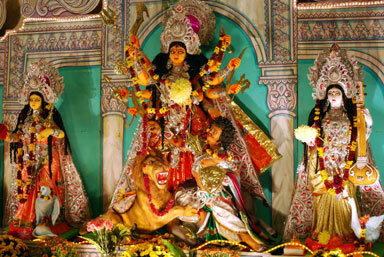 Although according to the Bengali calender the puja starts (Maha Shasthi) on Sunday October 2, the enthusiastic New Jersey Bengalis are not willing to wait that long. ICC of Garden State will start their festival on Saturday 24th September and continue till Sunday the 25th. The Puja will be held at the Mt Olive High School, 18 Corey Rd, Flanders, NJ 07836. They have also lined up an impressive cultural program featuring the famous Bengali singer Nachiketa (more on Nachiketa later), a Bengali play from Toronto, and Soumen Adhikari, another singer from Kolkata. Several other local programs and great food also awaits the attendees. Note: I just learnt that ICC has canceled Nachiketa’s program due to lack of timely confirmation from the artist’s agent. Instead, they will be presenting Nirmalya Ray, a well known artist to the NJ music lovers. On 25th early morning, Ananda Mandir will be invoking Devi Durga with their live annual Mahalaya Mahishasura Mardini presentation. Over the years, this program has developed a great following with overflowing crowd, all coming in from far and near at 4.00am in the morning. Good words of this event has spread far and beyond the US shores. So if you want to attend this event, then arrive at the Mandir by 4.00am to secure a seat. The event is generally followed by a traditional Bengali breakfast of Luchi, Aloor dom and Jilipi, although I am not sure if this tradition is to continue this year. Kallol of New Jersey will be celebrating their Puja starting on Friday Sept 30 and continue till Sunday October 2nd. Kallol’’s cultural program has always been a mix of local and guest performers of excellent quality. This year, on Kallol’s stage Purbayan Chatterjee ( Sitar) along with Pandit Anindyo Chatterjee (Tabla) will be presenting “String Struck” on Friday evening, a classical musical program including Sitar and vocal music. The famous singer Nachiketa will be presenting his concert “Tumi Sesh Parjonto” on Saturday evening. Sunday evening will feature Aparna Sen (readings) along with Soumajit Das (vocals) and Sourendra Mallik (piano), to present “You and I… Lovingly Yours”. The other events that promise to enthrall the audience include, “Bisarjan” a program of dance and recitation directed by Faroque Azam and “Durga Stotra” a dance recital by Mili Bhattacharya, both on Friday. On Saturday the Kallol children will perform “A Wonderful World”, a musical play written and directed by Aparajita Das. This futuristic play brings a group of friends into an endangered world wrought by global warming, resource depletion, and life form extinction. Their journey creates an open window into the dangers of what life can become for our children and the future of the planet. The ex-New Jerseyan, Tarun Chatterjee, will stage “Kabar” a play by Minir Choudhury with his team from Columbus Ohio. Mina Basu Nag (Nritya Creations) & Sanjeeb Bhattacharya will also present a dance recital. On Sunday, Kallol’s choreographer and director, Sunrita Mitra pays homage to Rabindranath Tagore by presenting highlights of three immortal creations, “Taasher Desh”, “Chitrangada” and “Chandalika” in a single musical and dance presentation titled “Troyee”. Songs by Pratibha Singh & Soumen Nandi (Sa Re Ga Ma Pa Challenge 2009 finalists) on Saturday evening. On Sunday, the events include “Surer Biswayane Rabindranath, a GSCA musical production followed by Monomoy Bhattacharya (Kolkata) concert of modern Bengali Songs. Anandamandir will be celabrating their Durga Puja from October 2 to 6 as per the Bengali calendar and so will Bharat Sevashram Sangha. However, at this time I do not have any information regarding their cultural programs. Like cultural programs, food is an integral part of any Durga Puja celebration in New Jersey. All the organizers promise to have scrumptious dinner on all evenings during the Pujas. “Panthar Mansho” (goat meat) will be the key attraction at all the community Puja’s except at the Anandamandir and Bharat Sevashram Sangha temples. I hope that you all will have a great Durga Puja and enjoy the festival to the fullest.